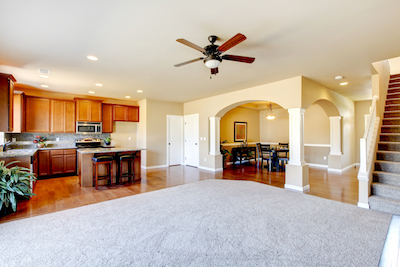 One of the most common questions we get is: Do I have to have the same flooring throughout my house? The answer, of course, is no. It’s rare that a home will have the same flooring from top to bottom, in every room in the house. Most often, you’ll find tile in the bathrooms, hardwood throughout the living space, and carpet in the bedrooms. That’s not saying you can’t mix it up a bit and select flooring based on your taste and lifestyle. Have fun with your flooring – it’s your home! But once you decide to install different types of flooring throughout your home, it can be a bit tricky making sure it all looks great. Let our design team pull a look together you’re sure to love for years. Read on for a little advice before you shop our store. You can keep it simple, with a clean look between the two. You can play with patterns, adding definition and personality between the two rooms. You can add details – perfect for tile work that can build intricate details with borders and thresholds. Or focus on patterns – who says transitions have to be straight? We’ve seen some beautiful transitions that zigzag through a room to add creativity and design. While you might have an idea in mind, we can help make it a reality. Stop by today, and we’ll help you pick out the perfect flooring choices for your home.